I love the ease and simplicity of this rotating handlebar-mounted mapholder from ARVnavsupplies.com. I used this product for the first time the other day. What a world of difference! The 9”x 9” is the perfect size for AR. Having the map right in front of me increases speed, ease of use, and is incredibly convenient. 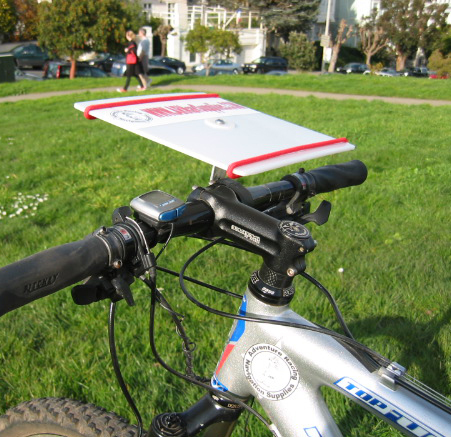 Having my old map case slap against my leg while pedaling wasn’t so bad. That is until you’ve been at it for 4-6 hours, you’re tired, and the case has hit the same spot on your leg for the 7000thtime! The map board does away with all that. One advantage I see with this board over others is the rotation. It rotates easily to allow you to orient the map as you go. I definitely recommend this product. I think the 9”by 9” is the perfect size. Any larger and it would interfere with my shifting any smaller and it would not have enough coverage. The handle bar clamp is a little inconvenient to close, but once it is, it stays solid. I think the shipping (almost 20% of the total cost) was steep in an age of free shipping, but the product is still well worth it. This year marks Go Time Racing’s 5thAnnual Snotcycle Mountain Bike Race – a “weather be damned” rain, sleet, the nastier the better, race. In fact, the race directors even stated “we don’t want to hear any of the following crap: my drivetrain will get dirty, my race skinsuit might get muddy, my toes will get cold, I don’t like hiking with my bike through two feet of snow or I ‘m running low on bourbon.” Obviously, the tone of the race was set well before the start. I was only member of TeamHalfwayThere.com to race at the Freedom Center, but was pleased to see so many familiar faces and especially the Veloworks riders from another Spokes, Etc. sponsored team. I wanted to do this race to shake off the winter blahs and survive the snow covered trails. The Snot, as it is sometimes affectionately called, is a great early season tune-up to test your mettle against other riders while suffering in the frigid cold. The course built at the Freedom Center was a 5 Mile loop with 3 laps for cat 2 male 40+. Each lap is 5 miles of tight, twisting trail with only a few short-burst climbs totaling 650 feet of climbing coupled with 650 feet of descending. There are relatively few rocky/rooty technical sections, but plenty of stream crossings. For more on the actual course please refer to the outstanding Let Freedom Ring: Trail Review by Barry. My lingering image from the race was being chased by Joey Baird for more than an hour as he steadily gained ground on me throughout the first and second lap until he inexplicably crashed off the side of the trail and ended up in a heap on the ground during the third lap. For all you cyclocross fans, I’m pretty sure I heard someone say, “I think Joey’s okay,” so I rode onward to the finish like any good friend would, right Joey? My Snot experience was altogether a great one, but due to long lines at check in, I was late to the start of the Cat 2 Open race. Thanks to Rob, the Race Director, for letting me race in the Cat 2 40+ division that I also qualified for and which started few minutes after the race I missed. This Snot brings the best local area mountain bike riders together for an early season clash and is one of the first not-to-be-missed tests of fitness coming off the winter. A special shout out to my teammate Barry (who at times suffers from Raynaud’s Phenomenon) for employing sound judgment to astutely size up the situation and realize that 26 degrees is fairly cold and thus returned to his warm bed instead of racing. Thanks for wimping out so the rest of us that raced have something to heckle you about now. 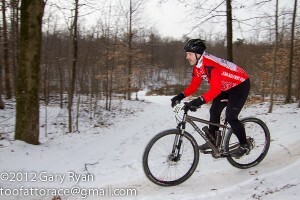 I finished 19th out of 58 racers in Cat 2 40+ division with a time of 1:47:37 for 3 laps of the race course. Be gentle with your gears and brakes in sub-freezing temps as less is certainly more. Given this was such a short race (under two hours), I ate calories right before the race started and then relied only on some warm electrolyte drink from insulated water bottles during the race to keep me going which worked perfectly. Snow covered trails can in fact be grippy, as can rocks, but tree roots are a different story entirely. Going out strong early to get up front given it was a narrow race course and then being able to settle in and pass a few riders while racing within myself and actually getting stronger and faster each lap.